Writing a paper. I was asked to write a paper on the future of digital hearing aids that was due three weeks ago. Here’s a copy of the draft that I submitted. The journal is targetted to both clinicians and researchers, so this paper is written for a broad audience. The final version will be modified from this after it goes through a peer-review system. Family reunion. Lots of fun, drinking, eating. Good to see all of my relatives. Spent evenings on a farm and heard coyotes howling at night—sounded like escaped lunatics laughing maniacally. Co-chairing a conference. The most significant conference in my field takes place every two years at Lake Tahoe. 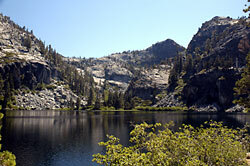 A beautiful location for inspired discussions (the photo here is of Eagle Lake, a short hike up from Lake Tahoe). I was pleased to see several presentations on cognition, a relatively new topic to this field. I’ve posted before on the growing prominence of cognitive science in a variety of fields, and it’s certainly starting to be the case in my field. I even spend a significant part the paper I recently wrote talking about how cognitive science will impact hearing aid technology (starting on page 15 of the paper linked above). Corporate strategic retreat. Obviously, I can’t say much about this, but I can note that being a vegetarian in northern Minnesota is a test of mental and physical endurance (not for me, for my colleague). I can also state that it’s good to be tall when playing beach volleyball. Buying a house. After signing our names two thousand times, my wife and I are near to closing on a house in SF. Phew. Now what do I do with all of my college furniture? humans have a limited capacity for attention which thus limits the amount of information processed at any particular time. I lecture about this phenomenon because hearing loss may cause more attention to be applied to understanding speech, diminishing the supply of attention available for other tasks. On the other hand, hearing aids may reduce attentional load and free attentional resources for other tasks. An amazing experiment by Daniel Simons and Chris Chabris demonstrates inattentional blindness with a video of people tossing a ball around and a gorilla-suited interloper. Subjects are asked to count how many times a team of people wearing white pass a ball. in the middle of the movie, someone in a gorilla suit walks across the scene, yet less than half of the subjects notice this odd event. The movie can be seen here along with other demos found on the University of Illinois Visual Cognition Lab’s demo page. The reason that I am mentioning this is because Seema Clifasefi at the University of Washington recently repeated the experiment with intoxicated subjects, as noted in Science Daily. 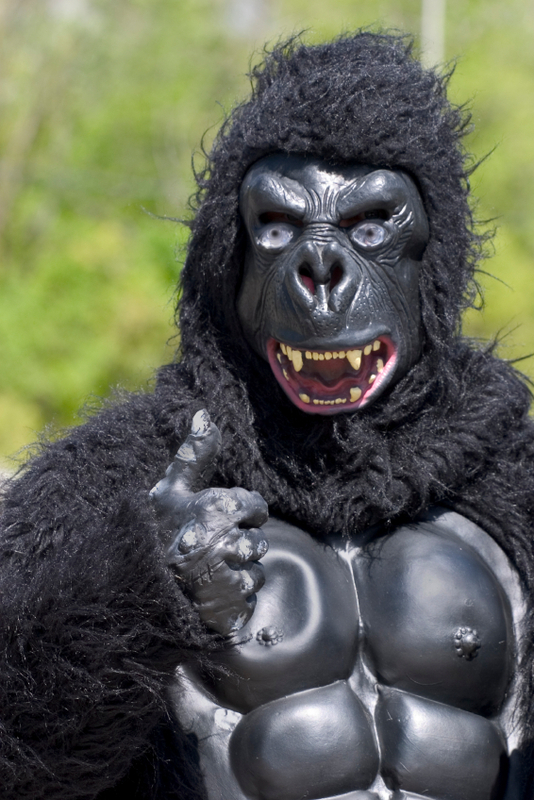 46 percent of sober subjects said that they saw the gorilla while only 18 percent of the intoxicated subjects said that they saw the gorilla. The intoxicated subjects were given enough alcohol to place their blood alcohol level at 0.04, half the legal definition of being drunk in most states. According to this site, a 200 pound male who drinks four beers in two hours has a blood alcohol level just over 0.04. So, a legal level of intoxication cuts the number of concentrating subjects who were able to notice the unexpected by almost two-thirds. There are obvious conclusions to be drawn between these results and attentional ability while driving after a few drinks. Counting ball passes becomes paying attention to the road, the gorilla becomes unexpected pedestrians. Add in an act of looking at your on-board GPS or fiddling with your iPod, and attentional ability becomes decimated very quickly. It’s no wonder that Apple is developing new technology for iPod/iTunes such that the iPod will speak track names to you so that you don’t have to look at its screen while driving. However, this will still have an impact on attention and possibly increase the attentional blindness effect. Because the blogosphere has been focused on attentional issues, it’s also interesting to think about how alcohol might affect such issues as attention overload and continuous partial attention. In an attention economy, is have a drink equivalent to reducing your economic power? Is alcohol accelerating the looming attention crisis? One could probably equate a glass of wine with a Blackberry when estimating impact on attention deficit trait. If attention has value, as stated by Attention Trust, and marketers can bargain for your attention, perhaps companies would like a breathalyzer attached to your PC to decide how much attention you really have to offer. Web designers, who should already be considering such issues as inattentional blindness when creating advertisements, might produce different ads for post-bar surfers. Certainly, a drink or two should be considered a continuous partial attention neutralizer. Some of these suggestions are a little insincere, but attention has been a hot topic in marketing and in internet technology for quite a while. I have little doubt that attention will have a significant impact in many fields in the future, which is one reason that I am lecturing on the topic to those interested in hearing aids and hearing ability. Cognitive science studies like the ones cited above will be scrutinized by companies to provide guidance for future product designs and as metrics of product impact. Weeks and weeks: am trying to buy a house in San Francisco.